This enchanting Dali Heart is just like the Crystal version, but the under surface has been silvered so that when rays of light touch its surface, it shines with muted colours of light, like the aurora borealis lights of the Milky Way. Cut in the contemporary asymmetric heart shape, this necklace is the perfect size to make a statement, without overpowering your outfits. 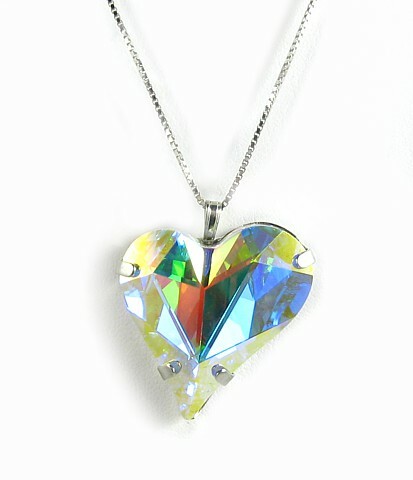 Made using 100% genuine Swarovski crystal for maximum sparkle, it is set on a Sterling Silver Mirror Box chain. Size: 3cm x 2.5cm. 41cm or 46cm Sterling Silver chain with 4.5cm extension.